Adore Beauty is an official stockist of Tan-Luxe. Tan-Luxe takes a next generation approach to self- tanning, making tailor-made, glowing skin a reality. Working in synergy with your existing body and skincare regime, each Tan-Luxe product is packed full of skin boosting ingredients including Raspberry Seed Oil, Aloe Vera, Vitamins B, C and E, alongside unique naturally derived tanning actives. 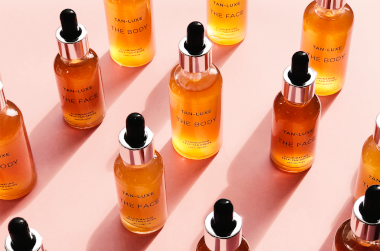 Taking the uncertainty out of self-tanning, Tan-Luxe delivers effortless glowing skin with No Streaks, No Smells, No Drama. It’s a soft scent, which is again good for the face, but you definitely need to avoid your eyes because it hurts a lot lol, and wash your hands very well, afterwards. I have gone through 3 bottles and about the purchase my 4th. I LOOOVE it! Hydrating but lightweight, no smell, no streaks and no effort. I&apos;ve tried multiple products that are similar but nothing compares to this. I&apos;m naturally quite fair but love a deep golden complexion so I love the med/dark, but I use the light/medium in winter for a golden glow. I find my makeup always looks so much better after I&apos;ve used this the night before, I always get compliments and the colour lasts so much longer than if I were to use a normal fake tan. Plus it fades beautifully with no patchiness or dryness. Best face tan product EVER! I&apos;m scared of using fake tan. The fear of putting it on, only to find patches hours later which are hard to get rid of is enough to put me off using it. This product however is wonderful! I&apos;m fair skinned and don&apos;t want a strong tan, just a "I&apos;ve spend a couple of days in the sun" look. One or two max applications of this gives me this look. It also smells lovely which is a bonus - I&apos;m onto my second bottle now.